Most spiders that look dangerous are not harmful at all. They simply look intimidating. Mexico's spiders tend to spend most of their time in tropical areas of the country. It is best to stay away from the spiders if you don't know enough about them. Look in northern Mexico. This is where you will see most of the common spiders in Mexico. There is the Common House Spider that is usually brown in color and spends most of its time in homes. They prefer homes that are vacant spinning webs and capturing their food. These are harmless spiders. The Green Lynx Spider can be found on prickly cactus and various flowers in the north. Watch out for the Jumping Spider. They live mostly in tropical areas of Mexico including fences and bark of trees. They are brown or black with two large eyes on the top of their head. White spots can be found on their abdomen. Their movements are unique with moving side to side. They got their name from jumping on their prey. Beware of the Black widow. This is the most dangerous since it is venomous. They will only bite when they feel threatened. 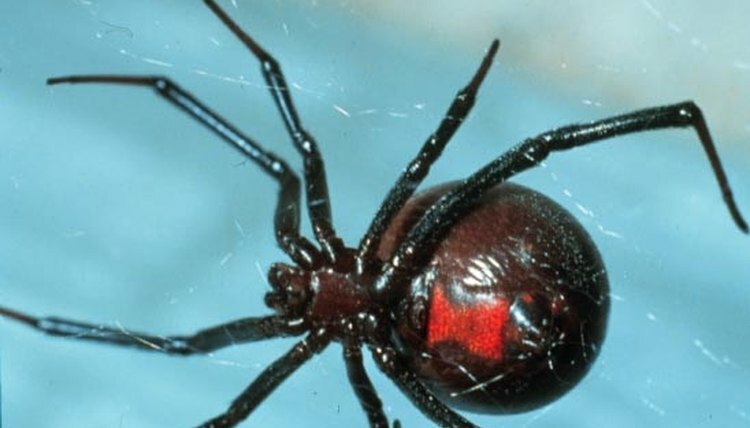 The Black Widow has a red hourglass marking on their abdomen while the rest of their body remains black. They can be found in basements of homes and outside of houses in dark areas. They live throughout Mexico. Look near water and shrubbery. The Colonial Spiders make their webs along these areas. These spiders are greyish brown with egg shape bodies and long legs. Look on leaves of plants or trees to find the Mexican Cupiennius Salei Spider. This spider doesn't spin webs and waits on leaves to capture their prey and go by vibration in order to find a mate. Walk through mountains in western Mexico and you will probably come across the Redknee Tarantula. They are dark in color with orange patches. They live mostly in burrows in soil banks. They are also one of the most common tarantulas kept as pets.